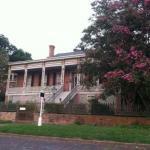 Located in Vicksburg Mississippi this bed and breakfast offers a full breakfast each morning. It has rooms with free Wi-Fi access. A coffee machine is available in each room at Corners Mansion Inn. Guests can enjoy a flat-screen cable TV. Towels and linens are provided as well as free toiletries. Special diets can be accommodated at Corners Mansion Inn B&B. A business centre is on site and daily maid service is offered. The property offers free parking. Vicksburg Convention Center is 7 minutesâ?? drive away. Guests will be 1.3 km from the Biedenharn Coca-Cola Museum.